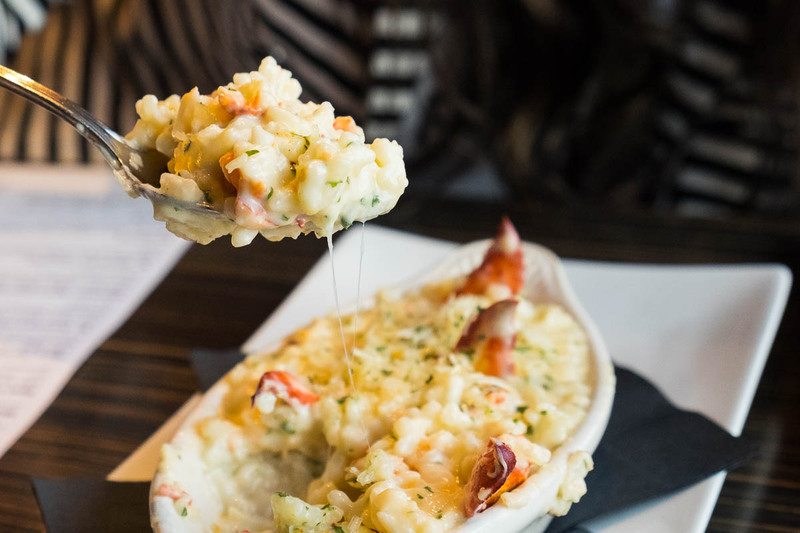 A spoonful of Lobster Risotto dangles warm strands of Parmesan at d'Vine Wine Bar in Cypress. Lately, there has been an influx of new dining options in Cypress, especially with the opening of The Borderwalk at Towne Lake. A few restaurants, though, were havens of sophisticated dining in the area long before that shopping center was even a gleam in a developer’s eye. d’Vine Wine Bar, just off the feeder road of Highway 290 (25202 Northwest Fwy) is one of those places. We were invited to come try a few dishes and were quite pleased to find that, to use an appropriate analogy, d’Vine has gotten even better with age. d’Vine is owned by Amy Vasquez and—fun fact for foodies who keep up with details—the chef is David Ortega. If the last name sounds familiar, it’s because he’s the cousin of multiple-time James Beard nominee Hugo Ortega of Caracol, Hugo’s, forthcoming downtown restaurant Xochi and more. The food at d’Vine, though, has an Italian bent—and Ortega is earnestly working to make it stand out. It is entirely possible to get an inexpensive introduction by taking advantage of the $5 happy hour specials. The Social Hour Menu is available from 4 to 6:30 p.m. and includes steamed mussels with either tomato basil- or cilantro-infused butter, three kinds of sizable flatbreads (margherita, wild boar or chicken Florentine), bruschetta with authentic prosciutto from Parma and a muffalata (or muffaletta, but the former is how they spell it here) with salami, prosciutto and olive tapenade. Of course, with a name like “d’Vine,” there had better be wine to go with all of that, and of course there’s plenty. Happy hour selections include $5 house Chardonnay, Riesling, Bordeaux and Pinot Noir. (I aimed for the Riesling and received the 2014 vintage of an off-dry Balthasar Ress from the Rhinegau region of Germany.) The Pinot Noir selection was the 2014 Caramel Road Monterey—a surprisingly deep one that would easily stand up to hearty meats. The house wine selection changes regularly; just ask the server what’s being served that day. There is also special happy hour pricing on flights of either bubbly ($10) or Pinot Noir ($12). The flights are a fun way to taste through a variety of wines. One called “Backpacking Through Europe” is $17 for all French wines and includes Côtes du Rhône from Château Saint Jean, a 2010 Bordeaux from Château Vieux Bonneau in Montagne-Saint-Émilion and another from Château Carmansac in the Haut-Médoc region. You can use happy hour as an introduction, but the truth is that you’ll be tempted to linger and try some of the more substantial dishes from the regular menu. 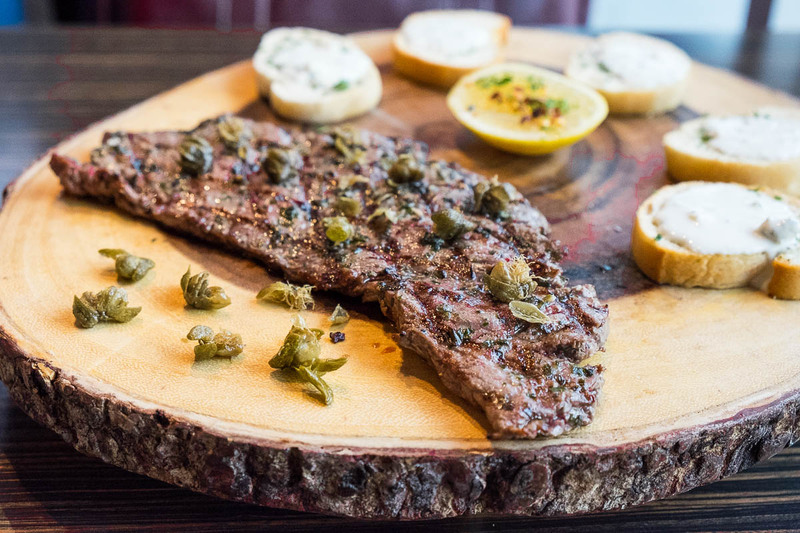 Even the “tapas” section includes selections on the larger side, including a surprisingly hefty three- to four-ounce USDA Prime Tenderloin Paillard accompanied by crispy-fried capers and toasty baguette rounds slathered with a cool, smooth blue cheese spread. “I had a customer come in the other day and he said this was the best steak he’d ever had,” said Ortega. The key to the $18 pounded tenderloin is the seasoned marinade, which include thyme, oregano, garlic and olive oil. Risotto here is the real deal, studded through with prime chunks of lobster claw meat. Ortega says he starts with Arborio rice and adds cream, chicken broth, butter, salt and pepper, then it gets a dose of Parmesan, the source of the delightful strands of cheese you get when you pull a spoonful upward. If there’s a flaw at d’Vine, it’s that they seem a little afraid of the salt shaker. A dash more in some of the dishes would enhance the existing flavors and make them truly electric. There’s no hesitation with red pepper flakes, though, and these make regular appearances. 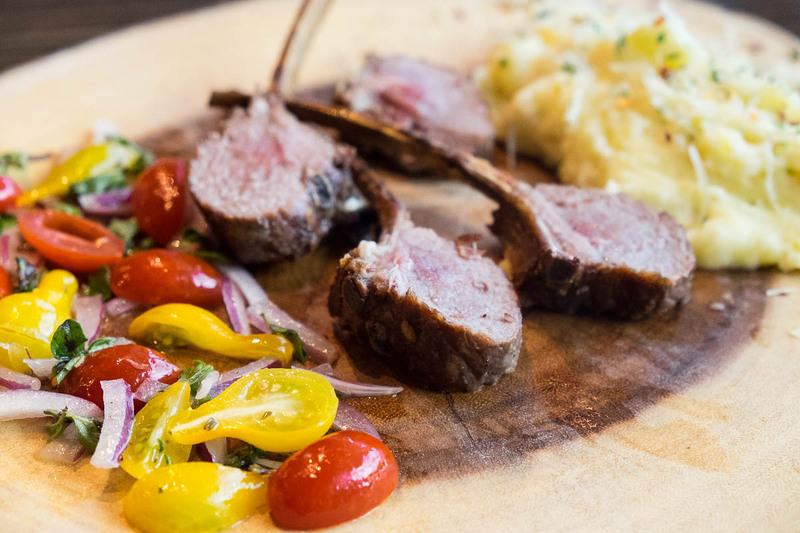 Our favorite, though, was on top of the addictive mashed potatoes that come alongside the corn cob-smoked New Zealand lamb chops, imbued with garlic and also topped with Parmesan. The lamb chops are just the thing for people who don’t like typically chewy lamb with rare centers. Thanks to being smoked, there’s a sense that these have been thoroughly cooked while retaining enough integrity of the meat for those who appreciate a more traditional take on the dish. Most restaurants in sleepy Cypress close at 9 p.m. on weekdays (except Fridays), so it’s really nice that d’Vine stays open later. It’s open Mondays through Wednesdays from 4 to 11 p.m., Thursdays and Fridays from 4 p.m. to midnight and on Saturday, it’s open from 4 to 1 a.m. The restaurant is closed on Sundays but available for private parties. The one important piece of advice is to allow an extra 30 minutes or so for your visit, because once you get there, it’s hard to find the motivation to leave the relaxed environment. Need a morning stop instead? In that case, check out Hanan’s Café in the back of the same shopping center. It’s the only place we know of in the area where we can get a Greenway Coffee fix, along with some light breakfast and lunch bites. Did you enjoy this article and find it useful? If so, consider supporting Houston Food Finder on Patreon. $5 a month takes care of one writer’s email hosting. Everything counts and is appreciated while we are still looking for appropriate advertising partners.